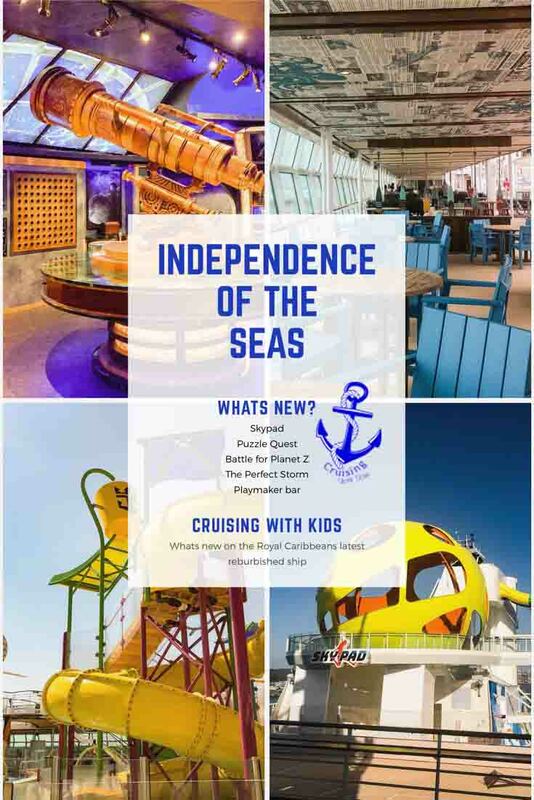 What’s New on the Independence of the Seas? Some new restaurants thrown in with your old favourites. Crazy Golf or Laser tag? 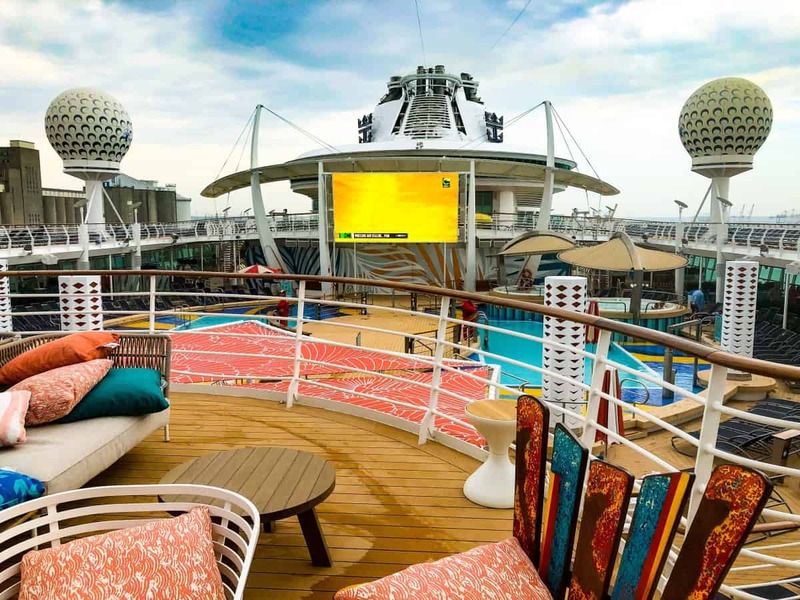 What’s new on the Independence of the Seas? 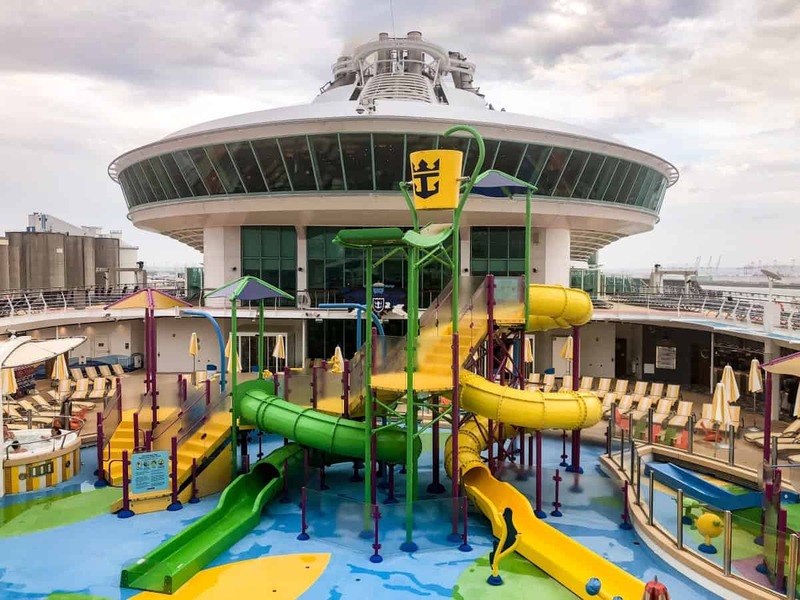 Royal Carribean’s Independence of the Seas has just come out of dry dock after a fabulous new refurbishment and update. The Independence of the Seas is a Freedom class ship and went in to service in 2008. It is lovely to see some great additions to this already magnificent ship. 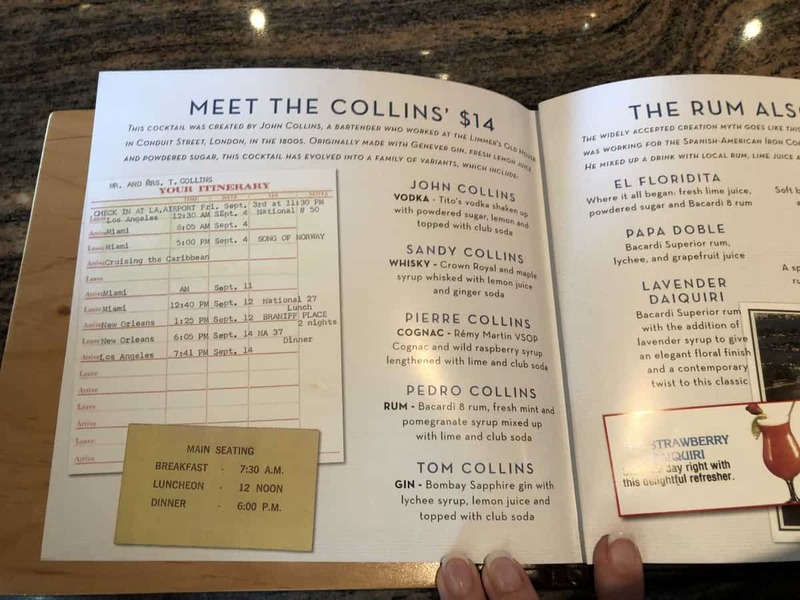 Read on for some of the remarkable things they have added to make it more cruise family friendly. 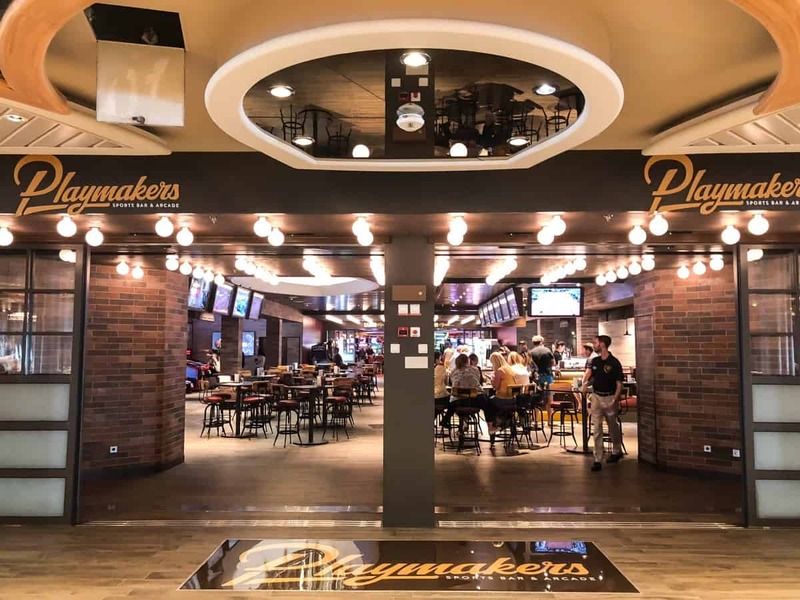 From the moment you step onboard the new Playmaker bar and arcade is an obvious addition. The Playmaker has a huge bar and seating area along with screens to watch the big game. The bar is buzzing and a hive of entertainment , the menu is a typical sports bar menu and they even have a chicken wings eating challenge. 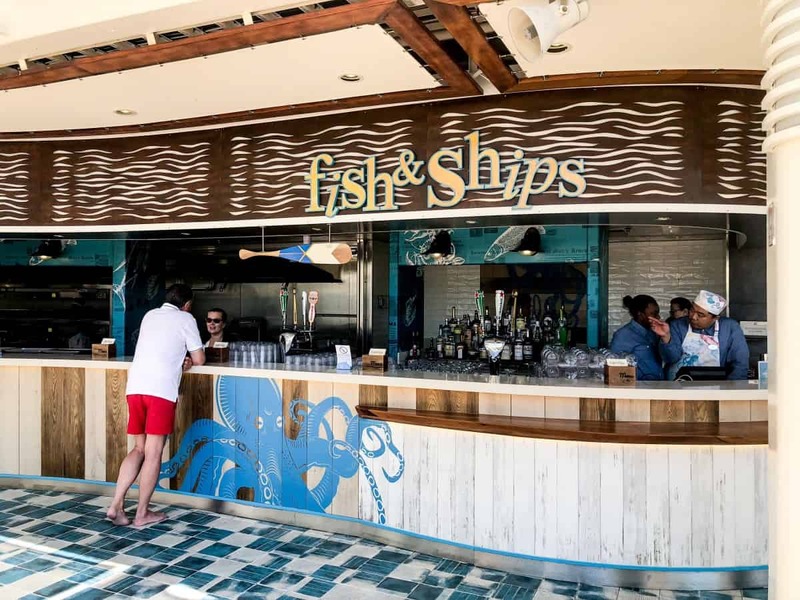 On the pool deck you can now find the new Fish and Chips bar which serves battered fish and even mushy peas. You can also find the new Izumi restaurant serving sushi and sashimi in place of the nightclub. There are still the old favourite restaurants too such as Sorrentos for pizza and your good old american Johnny Rockets. Do not worry the new dance floor can be found in Studio B late night. 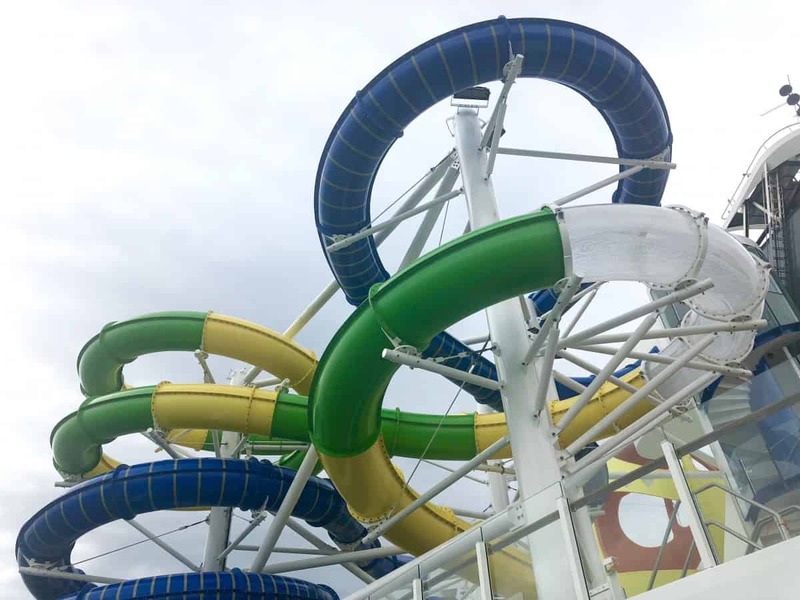 Splashaway bay is also all new and updated with a host of slides for the little children. Waterfalls and water cannons add to the fun and there is even a bucket that fills up and soaks you. Mini deckchairs are dotted about just for little ones around the pool area as well as plenty of beds for grown ups! Don’t forget the ice-cream machines are not far away either. There is a minimum height requirement of 42” and a maximum height requirement of 45” for the yellow slide. The perfect storm was also a great adjustment to the Independence. 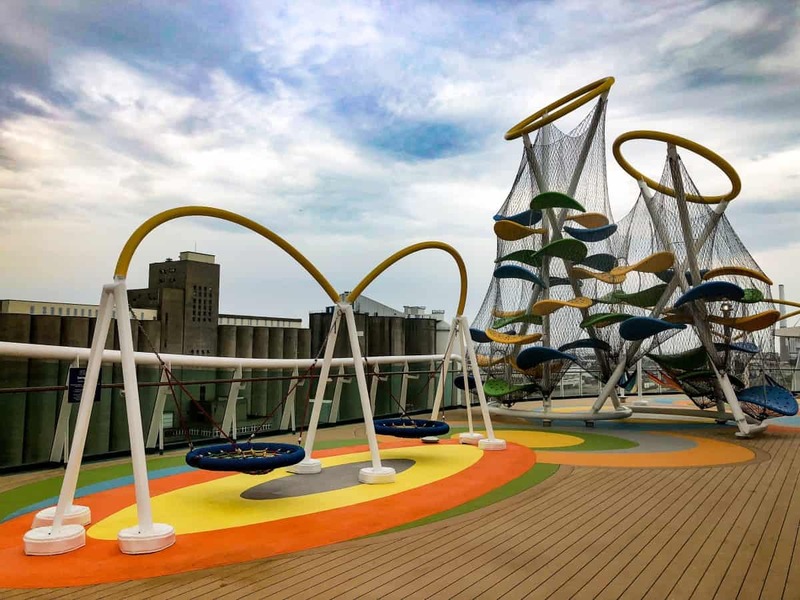 Two huge three story slides take you on a journey across the ship. The Typhoon and the Cyclone are dual racer slides with a real adrenaline rush. 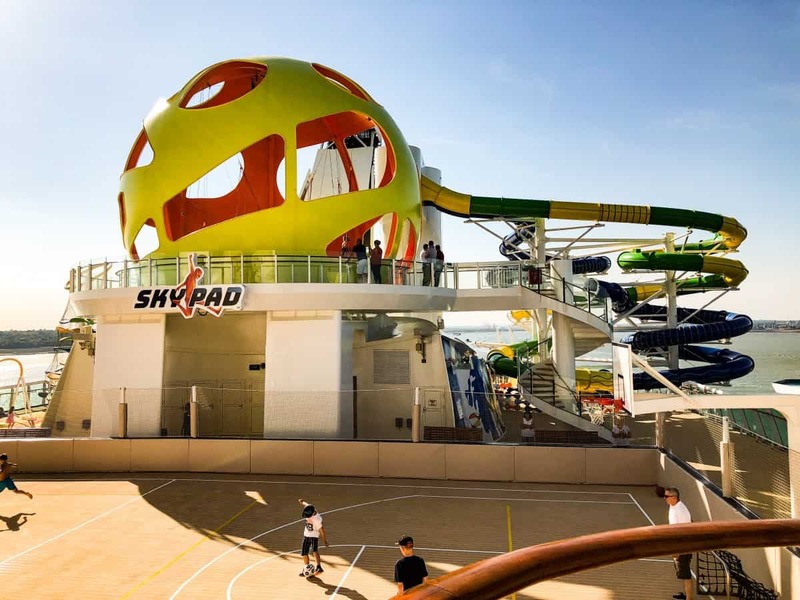 The Skypad is a totally unique experience onboard the Independence of the Sea. You are strapped in on a bungee trampoline with a virtual reality head set. You can launch in to space or even crush candy in a virtual reality world. Children as young as 5 can jump but to wear a headset they have to be 7. We loved all of the pockets of newly refurbished places onboard. The pools have new chairs and tables with plush new seating areas. New bars stools and even comfy cushions where you can snuggle up outside and watch a film on deck. The children have new climbing frames and cool places to hangout. There are swinging chairs and also hammocks around the ship and the kids club is still as good as ever. The outside space is packed with fun, The independence still has the sports court and the old favourite Flowrider. The new Crazy golf dunes on the Independence has been updated inline with the new larger ships. 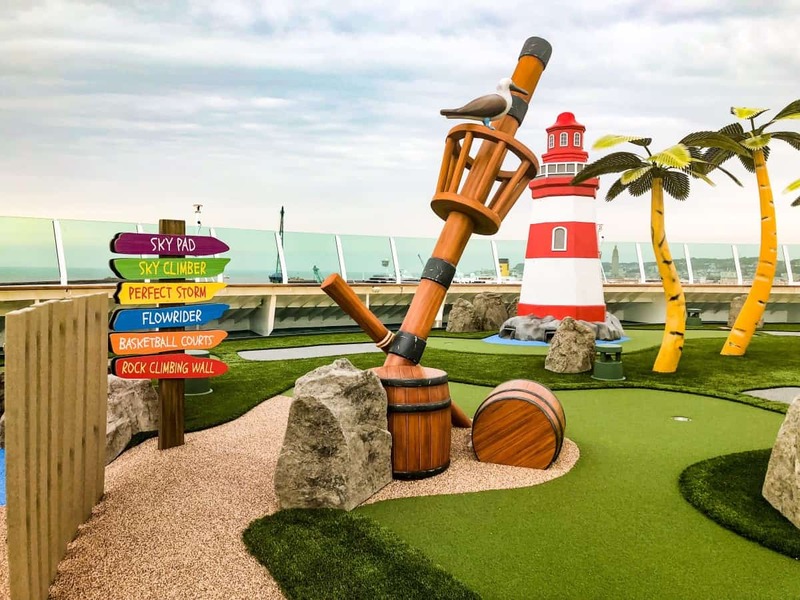 In this fun area you can grab a golf putt with your family and stroll through past lighthouses as well as palm trees. Additionally they have added the new Laser tag, The battle for Planet Z! Grab your glow in the dark Laser gear for a battle in a far flung galaxy. Children have to be 40″ or 5 years old to take part in laser tag. 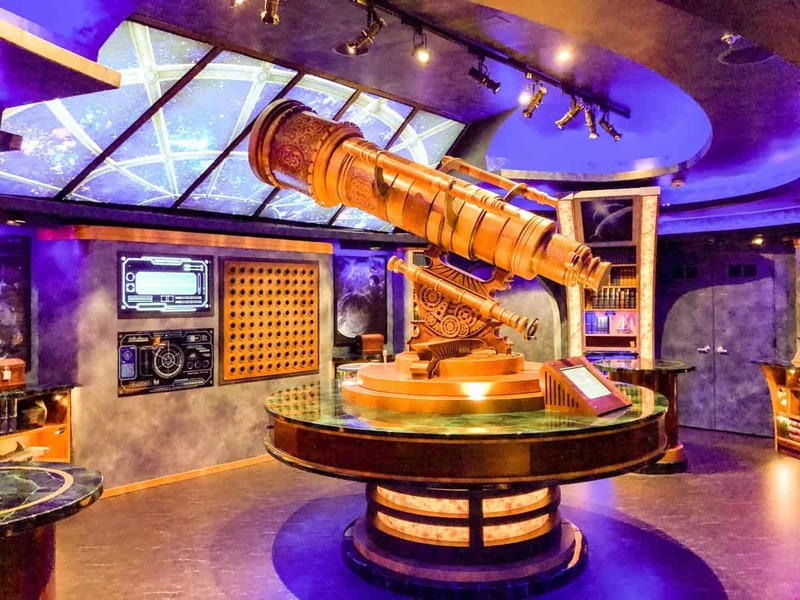 Perhaps one of the most amazing new experiences onboard the newly updated Independence of the Seas is the new Puzzle break out room, The observatorium. Book your slot for you and your guests and see if you can escape out of this locked puzzle room. Up to 10 people can take part at any one time and it requires great skill to unlock clues inside this room. The walls are also adorned with books, charts and interesting artefacts, you just have to find the ones that actually are the keys to your escape. Not only have all the public spaces been updated but the bar list has been updated too. Most cocktails are $14 this is covered in the drinks package along with other spirits. There are new and fun drinks on the menu furthermore there are still plenty of Soda machines for the children. I hope you enjoyed, What’s new on the Independence of the Seas? The new updates to the Independence of the Seas bring it in line with some of the amazing things found on the Oasis Class ships. Booking can be made on Royal Caribbeans website. The Independence is currently sailing out of Southampton and there are many itineraries to choose from. This looks like a perfect ship for families, I would like to do the virtual reality trampolining!